I don't want to startle you, but backpacking is not the exclusive provence of youth. The authors of these accounts are no longer youngsters. 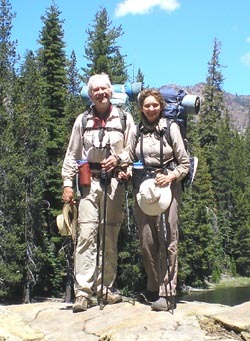 Barbara, my steadfast hiking companion, and I have already climbed past the chronological topo line of retirement. Neither of us know how many hikes we have left, which makes each new trek especially sweet. Yet what is contained in these accounts may still be of some interest to younger generations. What takes the authors two or even three days to accomplish, you may wish to attempt in a single day. But be forewarned, the faster you hurry through the wilderness, the more you are bound to miss. My first backpacking trip, at age 36, was an epiphany. How many wasted years had all these uninterpreted places been biding their time out there, promising, if not relevance, at least poignance, waiting for me to perceive them, to embrace them, to absorb them into my being? Twelve years later I was diagnosed with arthritis in my right hip. When I was 58, I had a total hip replacement. This then is a journal of backpacking before and after the total hip replacement and how I have come to terms with age and compromise without relinquishing the wilderness . If you find the pace unbearably laconic, the activities too anemic, the aspirations pathetic, you may want to print these pages out, put them aside, and return to them in thirty or forty years when your sinews are as brittle as old rubber bands and the blood no longer courses so vigorously through your veins. If you still have any interest in backpacking then.